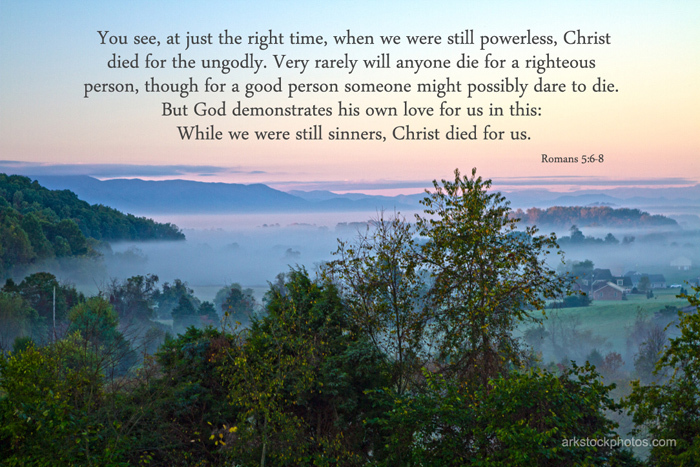 Christian Message Board And Forums: Romans 5:6-8 What Jesus our King did for us! » Christian Message Board And Forums » Bible Studies » The One Year Bible » Romans 5:6-8 What Jesus our King did for us! Author Topic: Romans 5:6-8 What Jesus our King did for us! It breaks my heart to know that God created such a beautiful world, so full of life and variety, and those he created to share it and care for it have instead caused so much destruction and pollution and pain and harm. And all the terrible things people have done to each other. I have wondered many, many times how He can bear watching all this happen. How can He still love us when we, as a race, have disappointed and offended Him on every level? Yet He does, and I pray for the day when He restores all things to the "good" He created them to be.